Taping knives are an indispensable part of every drywall professional’s toolkit. They are used for applying mud, finishing, laying tape, and more. A true workhorse, most projects would simply not be possible without a taping knife. Considering how important taping knives are, it’s critical to choose the right one for you and for your project. However, the number of options can be overwhelming: size, handle material, blade material, special features. How are you supposed to know which knife is right for you? This guide to the all the possibilities will take the guesswork out of choosing the right knife for you and your project. Size may be the single most important consideration in choosing a taping knife, as the size determines what stage of construction the knife is suited to. Smaller knives (6” and smaller) are best for the first stages of a project. Their smaller size allows you to get into smaller spaces and crevices, as well as use more pressure to force mud into seams and the holes left by screws. Smaller knives are more likely to leave marks and uneven surfaces, but in the initial stages, that’s okay, since you will come back to do another coat. Larger knives (6” and greater) are great for finishing, since they allow you to cover more ground with lighter pressure. These knives are great for smoothing the tracks left by smaller knives, feathering mud, and generally leaving a clean surface at the end stages of the project after detailing has been completed. There are, generally speaking, three materials used to form the blades of taping knives: stainless steel, carbon steel, and blue steel. Carbon steel knives are relatively uncommon, though you may encounter them occasionally. The differences between the materials may not be apparent at first, so let’s break them down. Stainless steel, a special form of steel that resists rusting and contains up to 10.5% chromium, is one of the two most common materials used for taping knife blades. The primary reason is durability: stainless steel is very hard and very long-lasting. Properly cared for, a stainless steel knife will last for many years. However, stainless steel, because of the hardness that makes it so long-wearing, is also less flexible than other knife styles. The result is that it will have a harder time feathering mud well, getting into corners, and is more prone to permanent bending than other blade types. In addition, stainless steel is harder to sand back to a new edge than softer steel blends. Carbon steel, in comparison to stainless, is considerably more flexible, and is thus well-suited to feathering, smoothing, and other fine tasks. However, carbon steel is very prone to rusting. As a result, it is more difficult to maintain and is generally not very popular as a blade material. Blue steel is, essentially, carbon steel which has been treated to resist rust. This treatment leaves a dark, blue-black surface which gives this alloy its name. Blue steel is more flexible than stainless and more rust-resistant than carbon steel. In general, blue steel is preferred by more experienced drywall professionals as its flexibility is best made use of by those who have a sure hand and the experience to make very fine adjustments. It does still require somewhat more maintenance than stainless, but can be easily kept in good shape by applying a light coat of oil between uses. There are three common handle materials: wood, plastic, and rubber. Which one you choose depends on a number of factors, such as budget, durability, and comfort. Wood handles are traditional, and popular with those who prioritize comfort and durability. They are beautiful to look at, hold up well to the demands of the job, and are comfortable to hold. On the other hand, wood handles are more expensive and heavier than other options, so while beautiful, they can be cumbersome if you carry a lot of knives. Some manufacturers offer wood handles as their own line, some offer wood handles as an option on other lines of knives. Plastic is durable and inexpensive, making it a great budget choice. It will last a long time with minimal investment up front. However, hard plastic handles are generally regarded as less comfortable than the other options (with some exceptions). Rubber is a great all-around material that balances durability with comfort. The improved grip offered by rubber allows the user to take a lighter hand when applying or working mud. As a result, rubber-handled knives are exceptionally well-suited to feather and finishing tasks that require greater precision. Beyond the basic handle material, there are a number of design considerations that can affect the use or comfort of a particular taping knife. These knives ditch the “handle in line with blade” design in favor of a shape puts the handle out of line with the blade. This allows for increased clearance for the fingers and reduces the possibility of accidentally marking the mud with your knuckles. This also allows you to bring the knife flatter to the wall, making it easier to achieve a perfect finish. Some knives are available with an extended handle that makes it easier to reach areas near the ceiling or in other hard-to-reach places. They trade improved reach for increased weight and reduced ease of carrying around the jobsite. Some knives offer plastic handles coated with another material, often rubber or another soft touch material. These knives seek to offer the comfort and light touch of a rubber handle with the budget and durability benefits of a plastic handle. Some drywall professionals use knives, some use trowels. 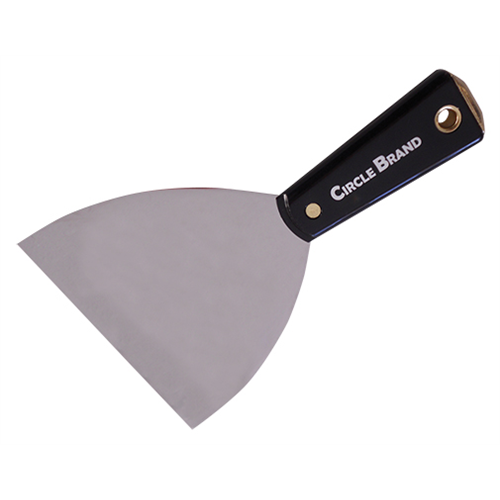 Trowels offer benefits such as a larger surface area blade (resulting in quick smoothing times) underneath an offset handle (no way to leave finger marks or indentations). On the other hand they can take more practice to use well (especially for feathering) and they aren’t as well-suited to small areas, so you may find that a mix of trowels and knives is the best way to go. Unlike knives, the best professional-grade trowels are typically available only in stainless steel as they don’t need to be flexible the way knives do. You are still likely, however, to find the same handle options as on taping knives (wood, plastic, rubber). Some manufacturers make a distinction between joint knives and taping knives. Generally, joint knives are smaller (6” and below) while taping knives are larger (6” and above). As you can see (and as noted above), this marks the 6” knife as the most versatile size. Additionally, joint knives are generally shaped like putty knives (rounded, sloping sides from the edge to the handle), though they aren’t sharpened the way that a putty knife is. Taping knives, on the other hand, are typically more rectangular. While in some applications they are interchangeable, the shape difference originates from the need to have a knife that can work inside corners – the smaller size and rounded shape make it easier to work inside corners without gouging or damaging the surface (though nowadays, many people use a specially-designed corner trowel for this job).